Looking out over the lagoon reef towards the overwater bures at Likuliku Lagoon Resort Fiji. On a visit to China two years ago, Prime Minister Frank Bainimarama invited investment in Fiji, and a developer named Freesoul Real Estate took him up on the offer. 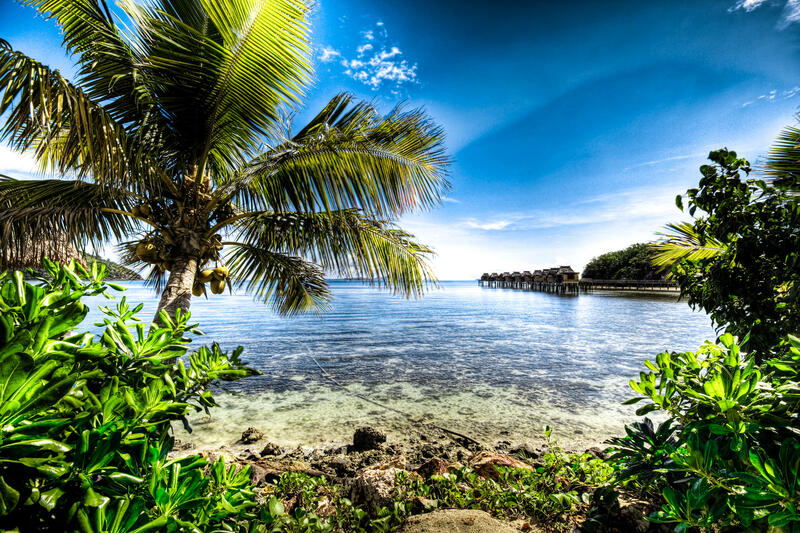 Last June, construction started on a 500 million dollar resort at Likuliku Lagoon, on Fiji’s Malolo Island, with some bungalows built out over the water and others nestled in mangroves ashore. Then RNZ Pacific reported that local villagers were outraged by the construction damage to their beaches, mangroves and reefs. A lawyer for the landowners said Freesoul had violated four stop work orders from the Department of the Environment. And the government of Fiji now denies that it ever granted permission to proceed. Freesoul denies any breach of law. In Vanuatu, the Chinese government granted aid to construct an impressive National Convention Center to attract international conferences to Port Vila. That hasn’t happened. Earlier this month, Prime Minister Charlot Salwai admitted that the facility has run up tens of thousands in unpaid electric bills and that there’s no money in the budget for maintenance. Since the government agreed to the project, Prime Minster Salwai said it must accept responsibility, but he called for more scrutiny of major development projects, particularly those funded by China.